It's remarkable that after all the action, adventure and Davis's silly schemes, the series is willing to slow down and devote an entire episode to Ken's backstory, covering his family life, first trip into the Digital World and the many factors that led him to become the Digimon Emperor. It's even more remarkable that one entire episode isn't enough. As emotional as this episode is, it tries to cover way too much and ends up raising more questions than it answers. This prevents the episode from reaching its full potential, but serves as a testament to how deep the Ken Ichijouji story runs. It would have been easy enough to have the villain from the first half of the series come from an unhappy family. Take some jaded kid who had awful parents and no friends at school and give him another world to use as a punching bag. The beauty of Ken's history is that his family seemed practically perfect from the outside, only to have several malfunctions that they all hid from each other. Ken was more overlooked than anything else, always in the shadow of his genius brother Sam. Sam had the duality of a typical big brother- happily blowing bubbles with Ken one minute and yelling at him for touching his stuff the next. Contrast this anger with the attention and praise his parents lavish on him and it's easy to see why Ken would occasionally dislike Sam. The big moment, of course, is when Ken wishes Sam would disappear, only for Sam to die in a car accident. While Ken's stewing over that unhappy coincidence amid a suddenly silent family, he receives a mysterious e-mail asking him to enter the Wired. 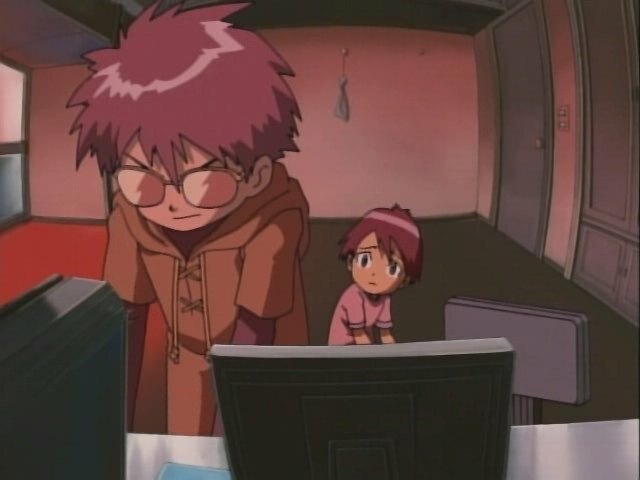 It truly is another page from the Lain playbook as the e-mail is freaky as all hell, playing off Ken's fear that he will always be compared to Sam and mentioning specifics like the digivice in the desk drawer. Ken obeys and finds himself standing in the Dark Ocean, where he lets it corrupt his Digivice. Or maybe he goes on an adventure with Ryo first. Or maybe that had already happened. Or maybe it comes later. The chronology of all that is really fuzzy in this episode and while it is eventually explained (the answer is “b”), the confusion is unnecessary clutter. There had to have been a better way to portray Wormmon as Ken's “heart” than to have him give a lengthy speech about kindness after a lame battle, all while Ryo's just standing there looking bored. What is important is that Ken realizes how important Wormmon is and returns to the Digital World to find him. 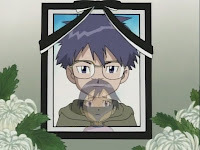 He has to put up with some remarkably snide and bitter baby Digimon along the way, but it all culminates when he recalls the good memories he had with his partner, and with his brother as well. In spite of his mistakes, both Wormmon and Sam saw Ken as kind and gentle and Ken resolves to someday see himself in the same light. He knows he went way too far for that to be instantaneous, but the fact that he's taking strides to see what they did is enough for Wormmon to be reborn. With him back, the road to redemption seems a little more manageable. One of the more appreciated sides to this episode is that of Ken's parents. Between losing Sam and nearly losing Ken twice, they certainly have been put through the ringer. Normally, that would be enough, but a respectable amount of time is spent reflecting on their mistakes as well as Ken's. They acknowledge that they were a little too proud to be raising a genius and enjoyed it a little too much, at the expense of loving every facet of their sons, including the parts that weren't all that special. While Ken feigning amnesia was overdramatic, him not knowing who he or they were served to illustrate that they didn't really know who he was either. It sets up the tearful reunion at the end where they're all just happy to have a clean slate. We'll have to save the dissertation on what the hell Ryo Akiyama was doing in this episode for another time. I've harped on this before, but Young Ken drifts way too much into Veemon's voice. The collage of identical ladies going on and on about Sam is almost as creepy as the e-mail from Chisa Yomoda Oikawa. While Sam was berating Ken, his hair and the position of his glasses provided a splitting image of the Digimon Emperor. It's safe to say that's not a coincidence. Like I said, there's all sorts of questions about the events in this episode, but most of them are explained later. I just wish I could remember which ones aren't. 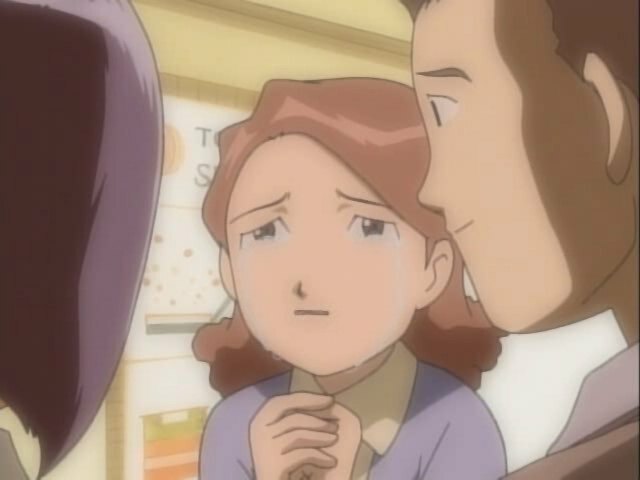 Ryo Akiyama: AKA secretly the most important recurring single character from 02 and Tamers. Stupid japanese only Digimon Adventure games. Ryo is more important than Takato and Jian?! That first picture makes it look like Sam has an ENORMOUS mustache.